Covering 71% of the Earth's surface and containing 97% of the planet's water, the ocean is a vast and complex ecosystem; it is intrinsically connected to other global ecosystems and is essential to all life, including our own. In this new hall, the importance and complexity of the ocean is revealed through a cross-disciplinary perspective—biological, geological, and anthropological. Information on understanding and predicting changes to the Earth's environment and on how to conserve and manage coastal and marine resources to meet our nation's economic, social, and environmental needs is also highlighted. 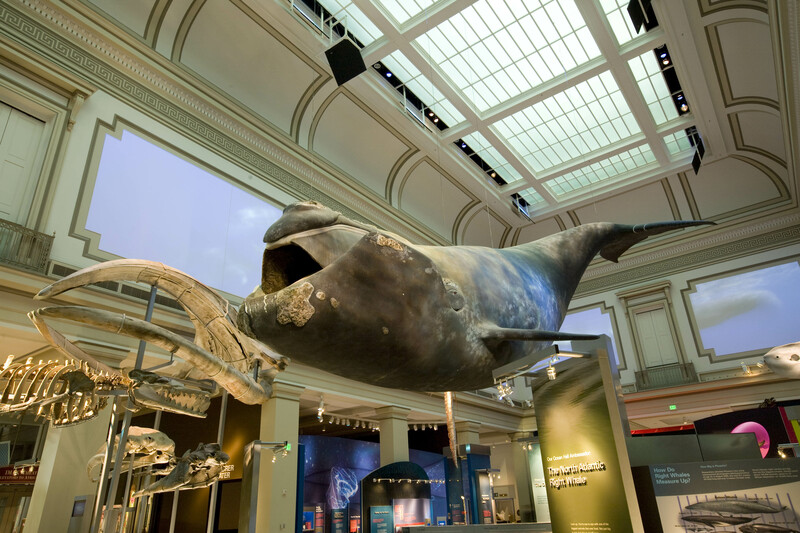 Highlights include a life-size model of a 45-foot North Atlantic right whale, based on the real female whale named Phoenix, the centerpiece of the exhibition; two giant squids; a set of 7-foot-tall jaws of the extinct great white shark (Carcharodon megalodon), the biggest shark that ever lived; and a 26-foot long Northwest Coast canoe, carved especially for the exhibition by a Tlingit master carver. Shores to Shallows highlights different kinds of coastal ecosystems around the world and how they are affected by humans. The Coral Reef, a 1,000-gallon aquarium featuring a living model of an Indo-Pacific coral reef ecosystem with some 50 live, colorful specimens. The Poles demonstrates the differences between the North and South poles and how life thrives at both through extreme adaptations. Ocean Systems, featuring "Science on a Sphere," a large rotating 360-degree global display suspended from the ceiling with images and narration that explains many of the complex aspects of the ocean, including what the ocean produces, how it changes, and how it interacts with the atmosphere. Journey Through Time gives visitors the opportunity to compare fossils of a large number of ancient animals; some are more than 500 million years old. Deep Ocean Exploration, a 13-minute video shown continuously in the exhibit theater, takes visitors on a dive to the very bottom of the ocean's floor in a submersible with scientists as they uncover some of the her deepest mysteries. Collections, featuring a special showcase, displays the world's largest and most diverse collection of marine specimens and explains how this collection helps scientists make sense of ocean life. Ocean in the News: An "Ocean Today" kiosk provides interactive ocean news—giving regular updates on ocean-related topics around the world. Focus Gallery featuring changing exhibitions (see separate listing).